I’ll let you in on a little secret. I love to read. I always have a stack of books waiting on the table next to the couch. And another stack on my bedside table. I get excited to dive into a story or learn something new from a great piece of non-fiction. I spend way too much time at the library (I even volunteer there). Books, literature and art are my creative comfort zone. I’ll be trying to stretch out of that comfort zone, just as you probably will, but you’ll have to bear with me at the beginning. I’m going to start with a lot of activities that center on books. It’s what I know best. It’s my creative instinct. This week and next, I’m going to highlight the work of Peter H. Reynolds, and I’m so excited! He has a series of absolutely amazing picture books that center around creative confidence. Many of his characters have lost their creative confidence, for one reason or another. They must seek out that confidence and work to grow it. Peter Reynolds’ books are beautifully illustrated. You may find the artistry alone enough to inspire you, but make sure that you stay for the story! Some of you are likely already familiar with the books, particularly if you have children. If you’ve never read them, you’re in for a treat. They are amazing books to inspire kids, but I think they may be even more important for adults, with messages we all need to hear. Think you’ve lost your creativity? Think you never had any in the first place? Take a journey with Marisol, Vashti, Ramon and Jerome. You may change your mind. It’s never too late to learn from the experiences of the characters in these books. I’m going to feature four of Peter Reynolds’ books over the course of two posts. Today, let’s take a look at The Dot and Ish. The Dot is a story about a girl who believes she cannot draw and refuses to complete her art project. Vashti is a great representation of the many kids and adults who feel they are incapable of expressing themselves through art. The teacher asks Vashti to make a mark, so she does. The turning point for Vashti is her acknowledgment that she does indeed have something to say, even if that something is a small dot. After signing the artwork, taking ownership of it, and seeing it framed and validated by her teacher, Vashti realizes that she has done something special and she challenges herself to do it better. She creates dot after dot, eventually filling a gallery with them, just like a bonafide artist. The takeaway here, for me, is the importance of validation. Going back to my post on ensuring a safe emotional space for creativity, creative confidence grows when effort is acknowledged and celebrated. If a child thinks no one is paying attention, that no one cares about what they have to say or what they can create, they will stop wanting to create at all. Everyone needs to feel heard, needs someone to lift them up, to kickstart their confidence by validating their effort. Now, let’s take a look at another book in Peter Reynolds’ collection, Ish. Perhaps, you feel like your art, your writing, your photography, your…whatever, isn’t good enough. If so, it may be time to consider what standard you’re trying to live up to. Ish will make you think about what happens when we abandon the quest for perfection. What if we appreciate what we can do, rather than always looking at what we lack? Ish is the story of a boy name Ramon. Ramon is a big fan of drawing and he thinks he’s quite good at it, until is confidence is completely knocked down by a few simple words from his brother. As we’ve already noted, confidence is very fragile. Ramon tries and tries to make his drawings look perfect and he’s about to give up on art altogether, when he realizes he has a fan in his little sister. She’s been taking his art, the pieces he’s rejected, thrown on the floor, and she’s been hanging them in her room. It is in this moment, when once again we see a character validated, that he realizes perfection isn’t the goal. His own interpretation of an object, a person, a feeling, is enough. Ish is enough. And in that feeling of ‘good enough’, he finds his freedom. I love this story. It shows how easily creative confidence can be torn away, but it also shows the flip-side. It shows that confidence can be built back up. It can be built by one person showing an interest. It can be built by simply changing the bar. What if our own style, our own interpretation is just as good as someone else’s? What if that perfection we’re always striving for is actually preventing us from hearing our own voice? Now it’s time for our Gently Guided Activities. I’ve got a few for today. Let’s start with The Dot. The Dot Activity #1: I’m going to start with a fairly simple activity to go along with The Dot, and it’s exactly what you think it’s going to be. Draw a dot. Paint a dot. Get a dot down on the page any way that you want. Now, look at your dot and ask yourself if you can do it better. How? Would bigger be better? More colorful? Should you use your hands? A pencil? What if you didn’t use a dot at all? Maybe dots aren’t your thing. Maybe your dot is actually a square. Or a triangle. Whatever simple shape you choose, make a few of them. Sign them. This is a beginning. Own it. The Dot Activity #2: Let’s try turning a dot, a line, a squiggle, a series of shapes into something more. This was one of my favorite activities to do with my daughter when she was younger. She’d mark up a page with wavy lines and then find the picture in the lines. She’d add to it, make it something more than a squiggle. It’s like finding shapes in the clouds. Below is an example. Can you see the random lines that became the painting? Can you see what was added later, to bring it alive? The Dot Activity # 3: Check out a book about art from the library or do a quick internet search to find artists who used shapes in their artwork. The work of Wassily Kandinsky is a great example. 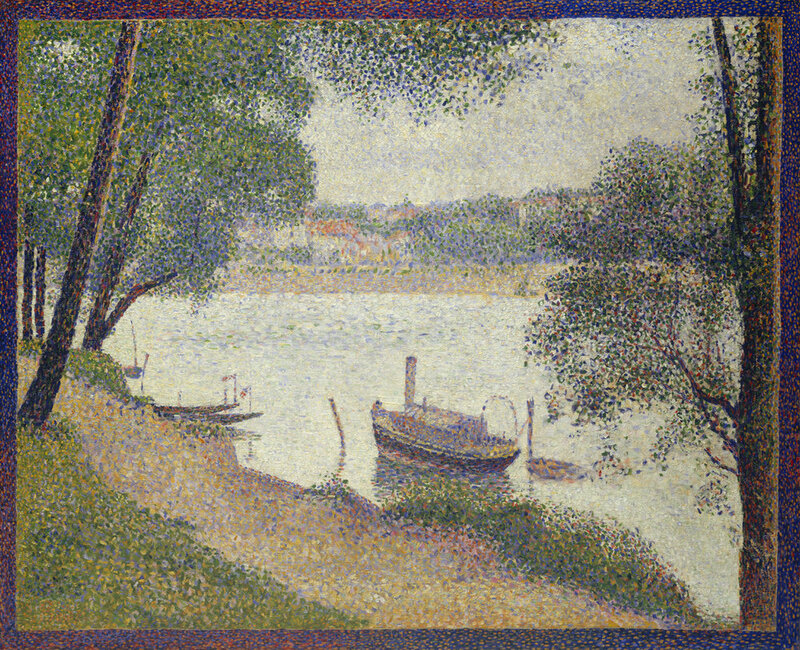 Check out the pointillism movement and look at how Georges Seurat created entire scenes from small dots. Look at the way that an artist may start with something as simple as a dot and end up with something so much more. Try out one of these styles for yourself. Ish Activity #1: Get a notebook or a sketchbook for your child. Better yet, get one for yourself, too! If you don’t have a notebook, staple together a small stack of plain paper. Let’s call this your Ish journal. Learn to draw, doodle or write like Ramon. Pick objects around your house or neighborhood and draw. Don’t strive for perfection. Sign each drawing and give it a name. Did you draw a cup? Name your art ‘Cup-ish’. Feel like writing a poem or a short story? Go for it. Just let it be -ish. Don’t over-think what you’re doing. Consider decorating the cover of your journal with a nice -ish drawing. Add color. Don’t add color. Use paint. Whatever you want, go for it! I took an Ish activity to a local co-working spot and had a blast watching the adults in the room draw. It’s amazing how much harder it is for adults to accept -ish. Ish Activity #2: A big part of both stories is the validation of the young artist. Hang up some art or writing. Frame it and hang it on the wall. Use clothespins to hang art from a string. Use a magnetic surface or cork board. You can even create a portable gallery out of a cardboard box. We used this box that I had turned into a puppet theatre when my daughter was small. She turned the backside into her own gallery. We could fold it up and put it away when we needed the space or leave it out so that she could proudly display her latest creations. Interested in a few of my mistakes? Watch the video below for some outtakes. Video-making is new for me! There’s always room to grow.